If your home has noticeable water damage that you want to address as quickly as you can, DenGlass remains recognized as being among the best ways to prevent moisture from entering your home. That is because it creates a barrier preventing moisture, as well as maintaining a mold-resistant surface. If you have water seeping through your exterior walls or when you need increased protection against rain, humidity, and wind, our best DenGlass framing services are right for you. DenGlass products get built with a variety of water-resistant building materials that work together to keep moisture out. By installing boards made from blended materials like fiberglass, gypsum, mesh, and other building material types, it creates a dry, protected envelope from water damage. That also creates a preferred cladding type that helps keep your home’s interior safe and dry. 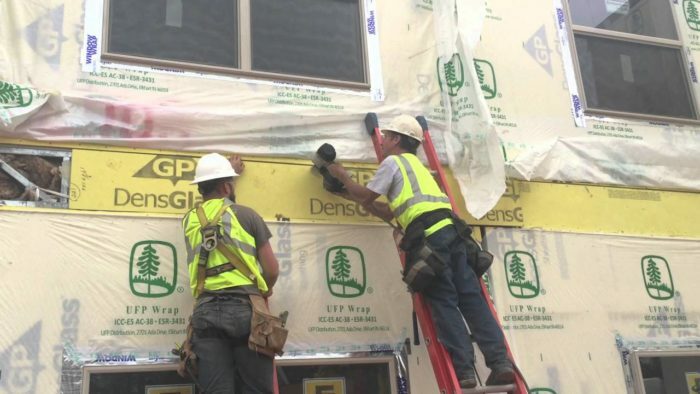 The application of DenGlass framing can be under the brick, siding, EIFS, stucco, rain screen, and other permanent cladding systems or ideal sheathing for attached, adhered, and fluid applied to air- and water-resistant barrier systems. DenGlass may be gold or silver. The Gold is a unique, ‘‘paperless’’sheathing panel made of patented water resistant and silicone-treated core surfaced with glass mat facings and a ‘‘gold’’ colored alkali-resistant coating which Provides superb protection from the elements. Dens-Glass Gold panels are highly resistant to delamination and deterioration due to weather. Dens-Glass Gold exhibits 50-100% greater flexural strength than regular gypsum sheathing, with dimensional stability that assures even substrate resistant to warping, rippling, buckling sagging and fire resistant. – Interior finish systems that require a substrate panel with superior fire and moisture resistance. Surface Preparation; the surface of framing and furring members to receive Dens-Glass should not vary more than 1⁄4 from the plane of faces of adjacent members. Offset end joints, if required, the joints should fit snugly and flash installed around all openings. Use the Dens-Glass panels of the maximum lengths possible to minimize the number of joints. The location of Edge joints must be parallel to and with vertical orientations on framing. DenGlass silver or gold sheathing can be installed vertically with the long edges parallel to the studs, or horizontally with the long sides perpendicular to the studs. DensGlass sheathing should extend from sill to top plate. Back horizontal joints when vertically applied with mounting for proper fastening. Fasten DensGlass sheathing so that the silver or gold side faces out. Sheathing should be fastened to wall framing considering appropriate spacing and staples. For shear resistance, apply panels vertically. Use fasteners and fastener spacing as listed in International Residential Code (IRC) Fasteners should be driven flush with the panel surface (do not countersink). You Should not use DensGlass sheathing as a base for nailing or mechanical fastening. Always follow your local building code. Installing DensGlass can also be done on a metal stud framing, the framing of the wall should be appropriate according to metal studs gauge and DensGlass Exterior Sheathing thickness. – When applying for painted ceilings and soffits, the joint tape must be used over joints and embedded in a specified, setting type joint compound. For the smooth finish, the surface should be skim coated with joint mixture. After the installation of all the DensGlass then the installation of two inches of DOW blue board foam for insulation. Next, the mason will install masonry anchors followed by a brick facade supported on the foundation brick shelf. At one point or another, the average home experiences some degree of water damage. However, large amounts of moisture, as well as ignoring the problem, soon leads to structural issues, as well as dangerous mold and mildew growth. If your home has noticeable water damage, you likely want to address it as quickly as you can. However, patching stucco is often not the best solution. Older homes especially struggle with moisture trapped behind stucco walls and EIFS wall systems. Rather than wasting time worrying about stucco, the issue may be with the wall behind it. One of the most frequently needed services that EIFS Installation California provides is DenGlass framing services. DenGlass remains recognized as being among the best ways to prevent moisture from entering your home. That is because it creates a barrier preventing moisture, as well as maintaining a mold-resistant surface. If you have water seeping through your exterior walls, it’s time to have us help you. Every home has a barrier of moisture resistant materials. However, older product types just don’t protect your home, as well as newer DenGlass, can. DenGlass products get built with a variety of water-resistant building materials that work together to keep moisture out. By installing boards made from blended materials like gypsum, fiberglass, mesh, and other building material types, it creates a dry, protected envelope from water damage. That creates a preferred cladding type that helps keep your home’s interior safe and dry. When you need increased protection against rain, humidity, and wind, our best DenGlass framing services are right for you.